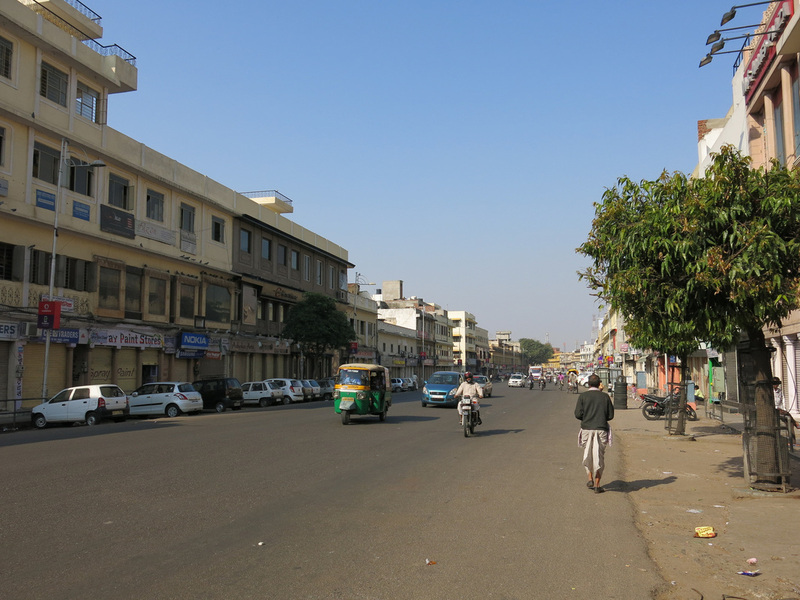 Whether it's an early morning or late evening arrival, the shopping and restaurant strip along MI Road serves as the standard introductory route to Jaipur. During breakfast I met Krishnan (a local resident, not the Hindu god) who offered me a seat at his table at India Coffee House. He made a good recommendation of a masala dosa, a potato filled crepe. He was also correct in noting this place served the best (and fortunately strongest) coffee in Jaipur. 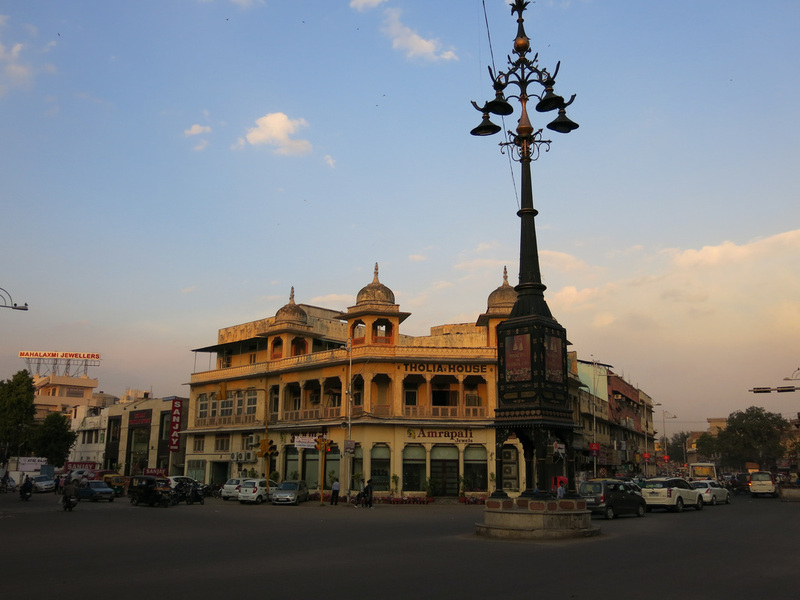 With a full stomach I criss-crossed Jaipur's historical area, the Pink City, a planned, grid organized urban center. The city received its colorful nickname when it's buildings were painted a pinkish salmon color, to make the buildings look more cosmopolitan and mask cheap materials, in advance of the Prince of Wales visit in 1876. 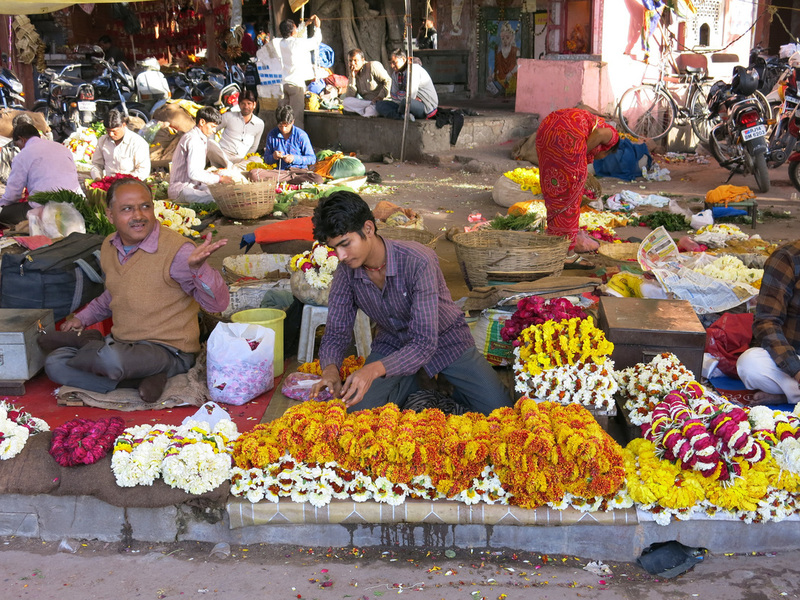 The streets are bazaars with shopkeepers lined compactly next to one another, although most are closed on Sundays. 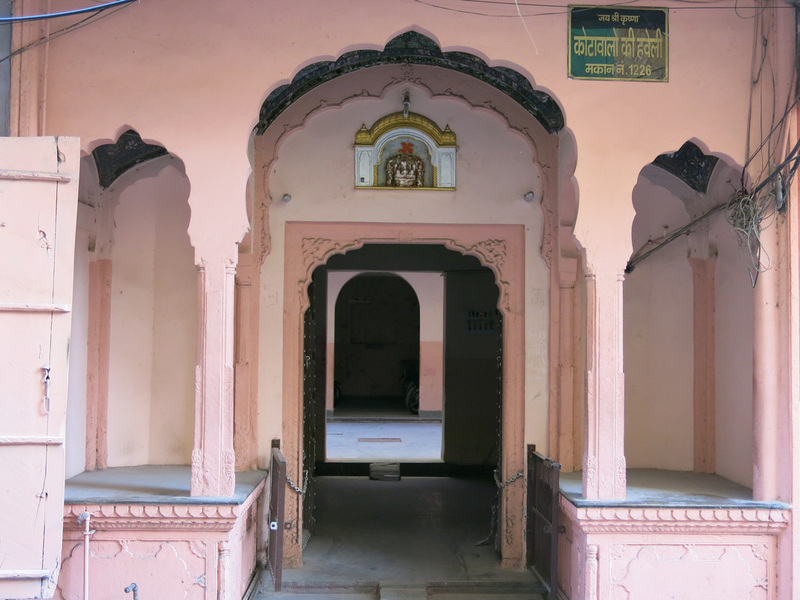 Open gateways lead to courtyards, homes, and temples. 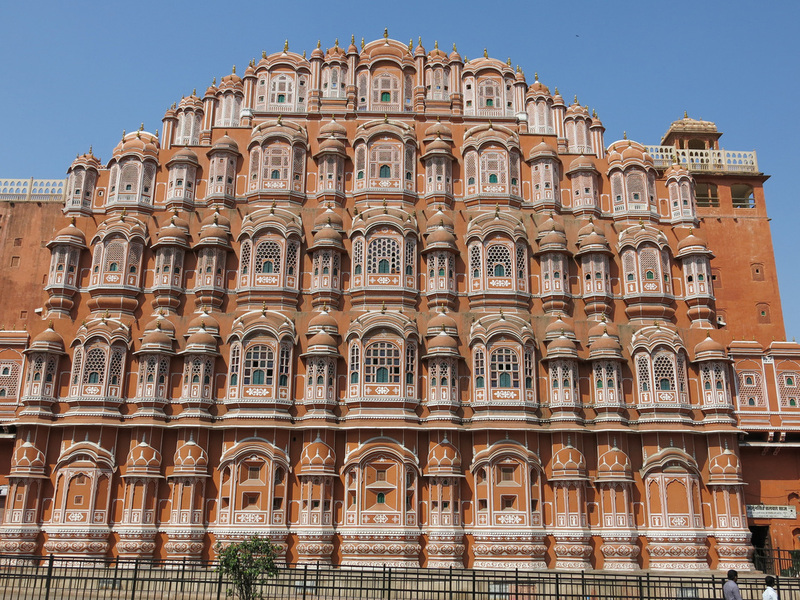 The three most prominent sites in The Pink City are Hawa Mahal, City Palace, and Jantar Mantar. 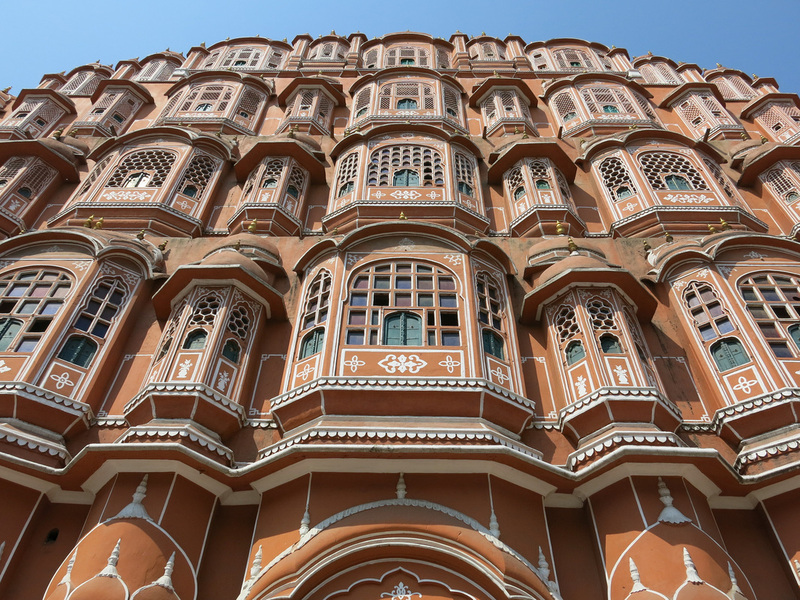 Hawa Mahal's defining feature is a five story screen wall that faces one of the bazaar streets. This allowed women in the royal family to observe daily life without being seen - legal to keep women as property...not legal for commoners to look at the women. The interior of the palace seems quite small by comparison to the five story screen - it seems to be missing living and dining quarters. There's an open courtyard, however, beyond this there's not much more to the palace. 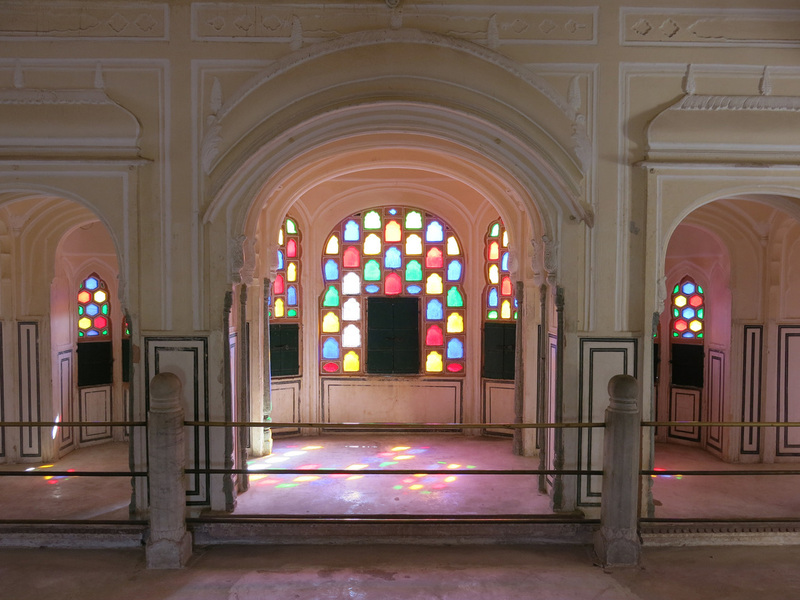 Visiting the palace in the morning allows for the eastern sun to show the building at its "pinkest" and light up the colored windows. 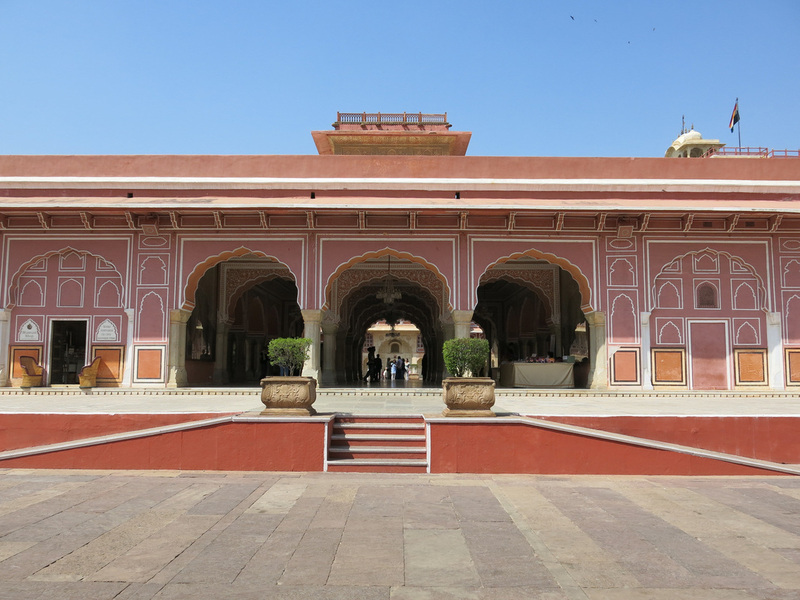 The City Palace is a five minute walk away through the Pink City. 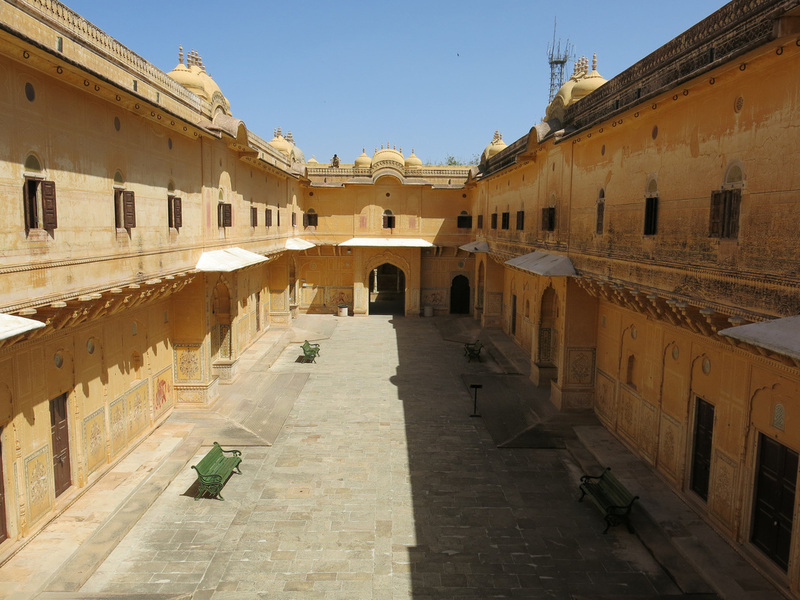 There's not much to the site - a royal Maharaja still resides in the palace complex so only a few outer courtyards are open to the public, although if you are willing to pay 2,500 rupees a portion of the private residence is available for a guided tour. Public area halls and buildings contain a textile and armory (lots of daggers and cutlasses) museum. 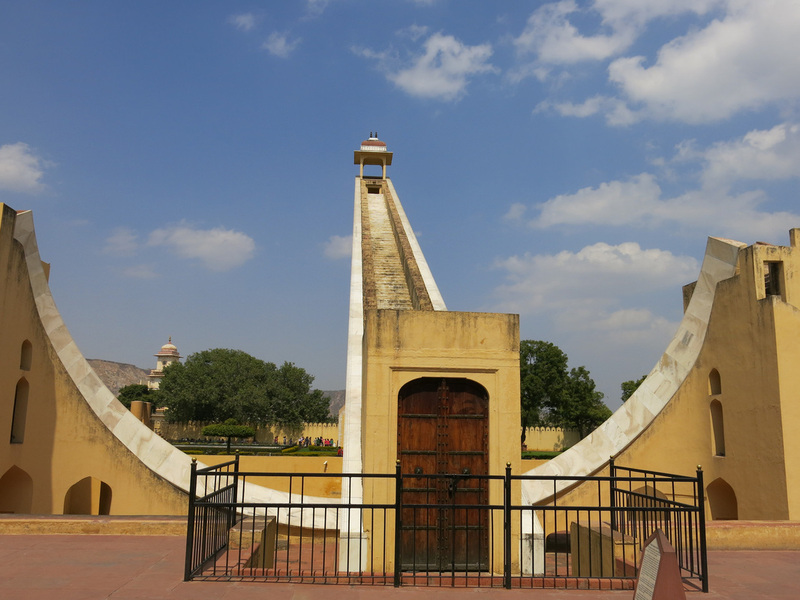 Opposite a square from the City Palace is the third site, Jantar Mantar, a distinct attraction with a collection of star gazing apparatuses scattered across a garden like setting. The largest instrument is a 90 feet tall sundial. 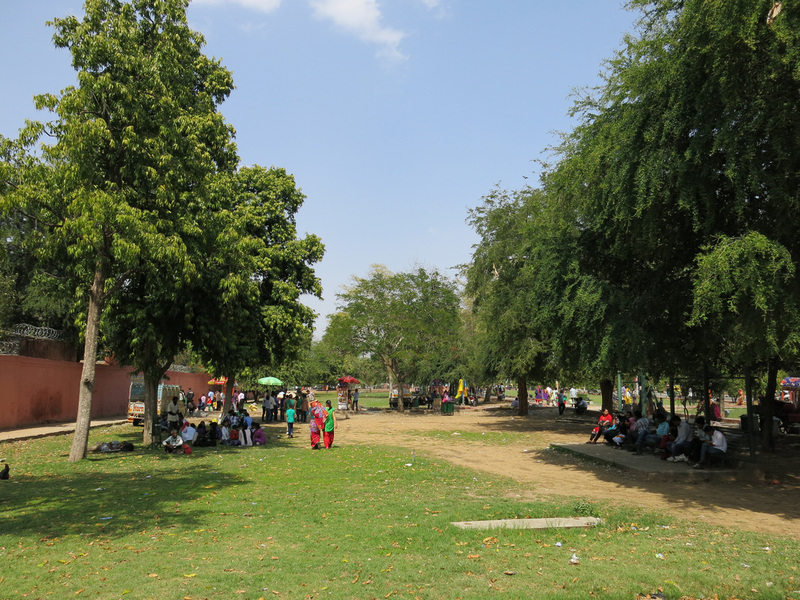 It's a park-like atmosphere with quite a bit of crowds. There are lots of smaller sundials too and other astronomy instruments, although they were used for astrology purposes. 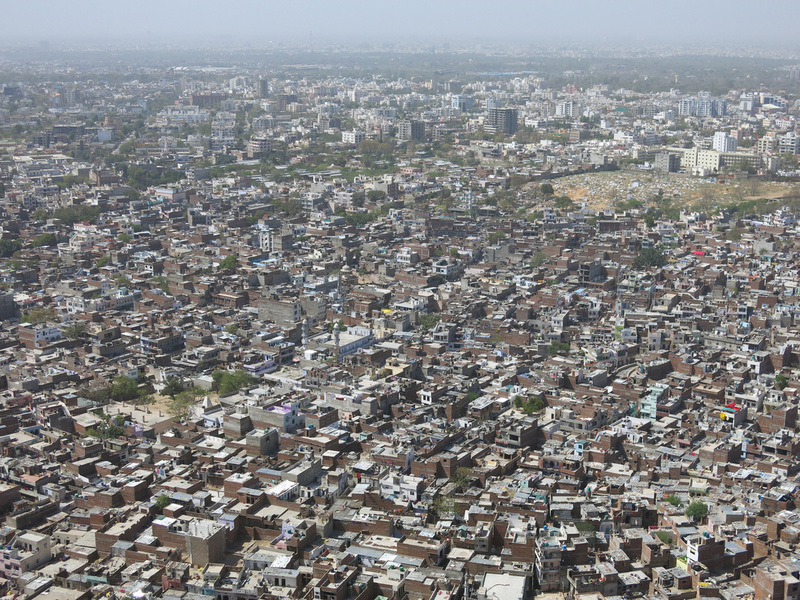 Contrasting the three Pink City sites are a collection of three forts within a forty minute tuk tuk ride of the city center. 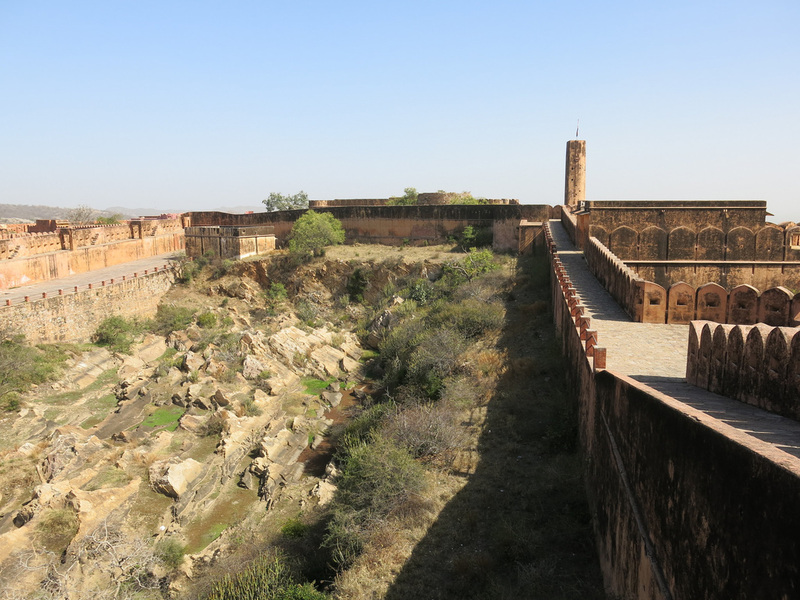 The first stop was Jaigarh Fort. The fort has two distinct sections. The city side section is not much more than a series of walls and ramparts. The far end contains Jaivana, the world's largest cannon. 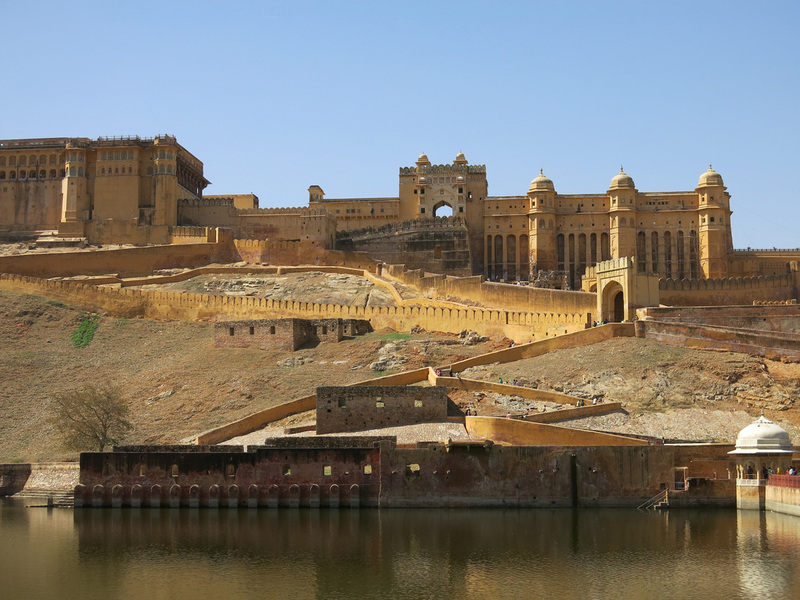 The Amber Fort side is more impressive and contains palace components such as king and queen chambers, dining halls, a theater room, and gardens. 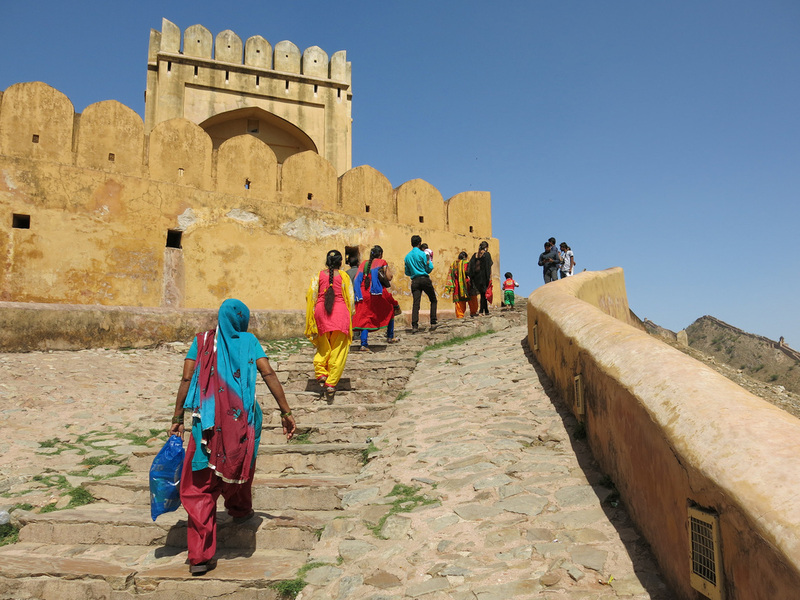 The walk along the far wall of the fort provides clear views of the surrounding mountains and the backside of Amber Fort below. A 1.5 kilometer tunnel connects the two forts. 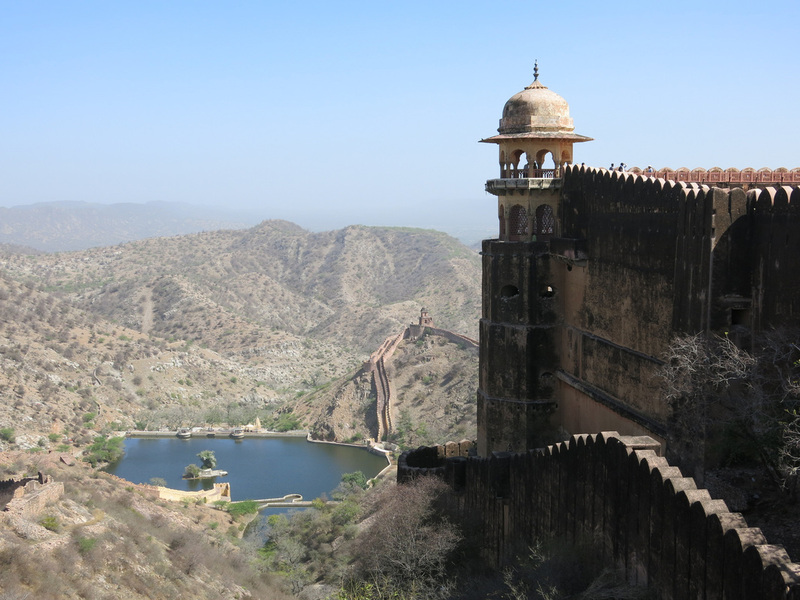 A bumpy ten minute ride beyond Jaigarh Fort is Nahargarh Fort. This fort was a frustrating disappointment - too far for too little. I walked along the ramparts only to reach a barbed wire fence deadend. 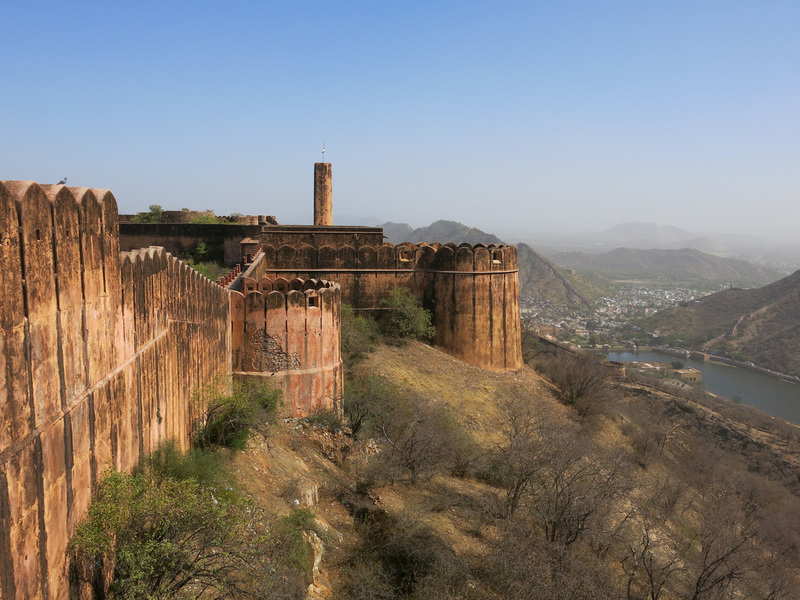 There's not much to the fort other than the panoramic views of Jaipur. 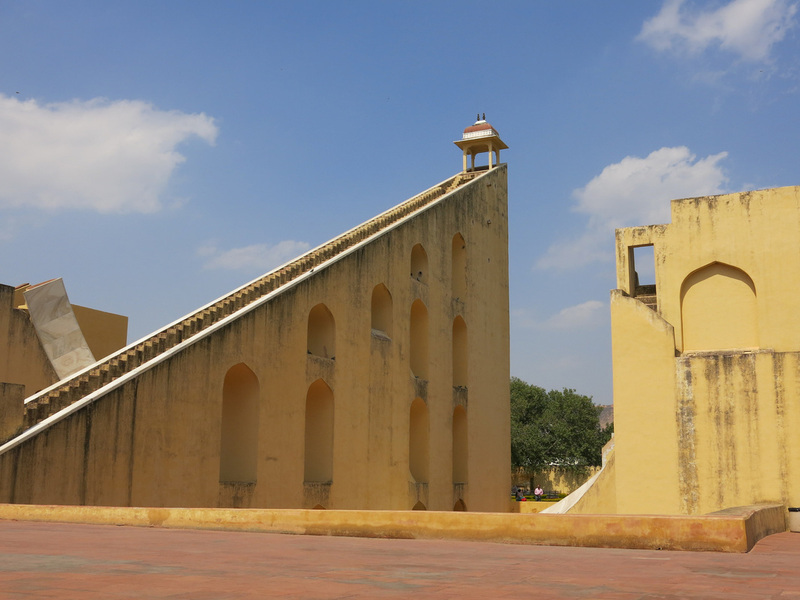 The Jantar Mantar and City Palace can be seen from the left hand corner of the fort's wall and I delicately ascended a narrow staircase to a platform for an unobstructed view. 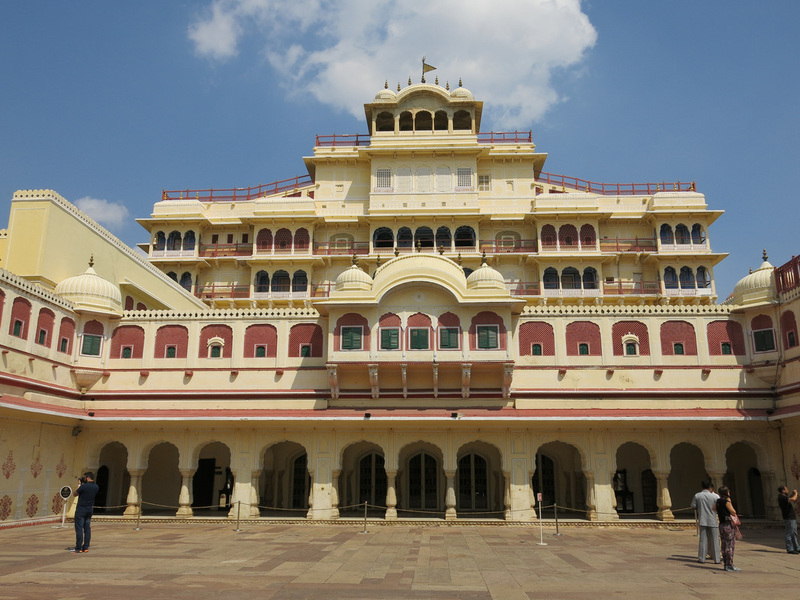 The fort includes Madhavendra Bhawan palace within this walls although this is a small complex with not much beyond the central corridor. A restaurant remains open through dinner to watch sunset if you time your visit for later in the afternoon - if that's your plan tell your tuk tuk driver in advance so the fort order will finish here. 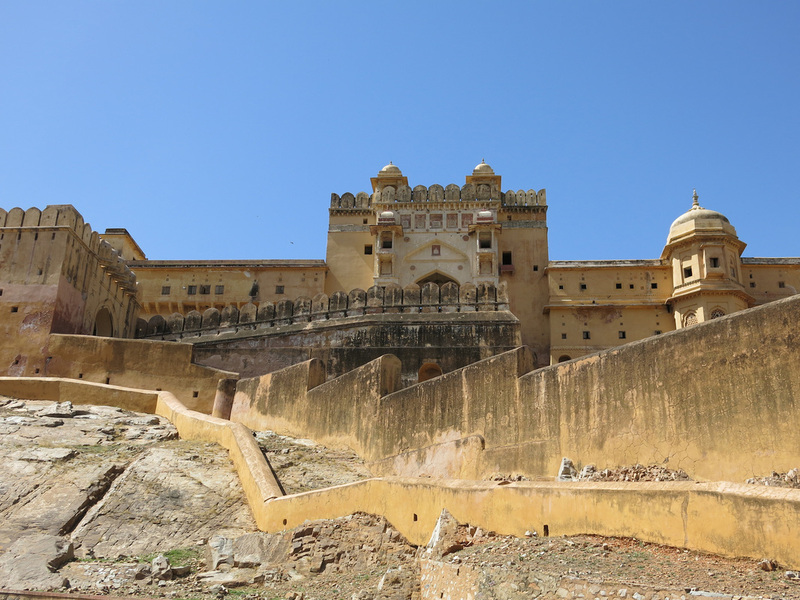 The ride downhill leads to Amber (Amer) Fort the most impressive of Jaipur's forts. A steep pathway leads to the forts gate and entrance courtyard. It's an impressive looking fort from the outside. A manmade lake sits at the base and its a steep and wide climb to the gate. A Ganesh image appears on the palace's gate within the fort and once I passed through I had free reign to explore most areas of the fort. 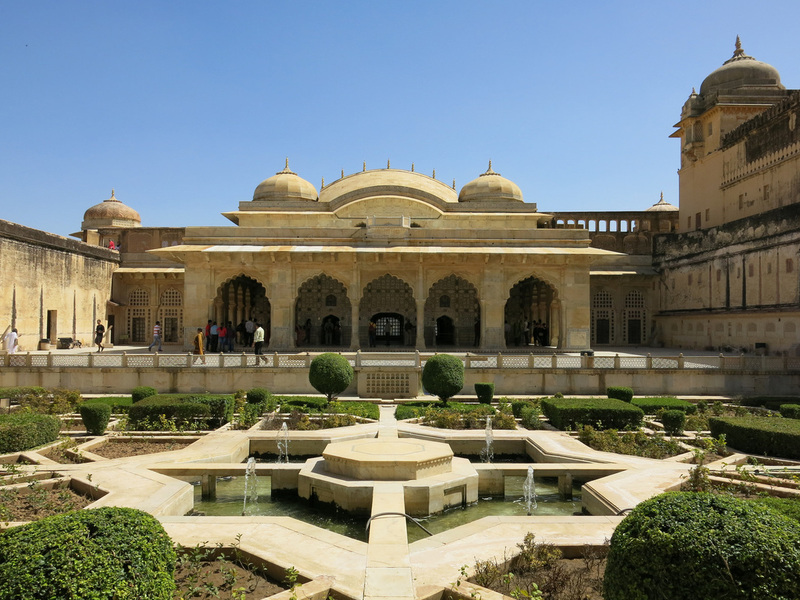 The palace seemed to lack the intricate details I saw at other palaces in Orchha, Agra Fort or Jodhpur's Mehrangarh Fort. 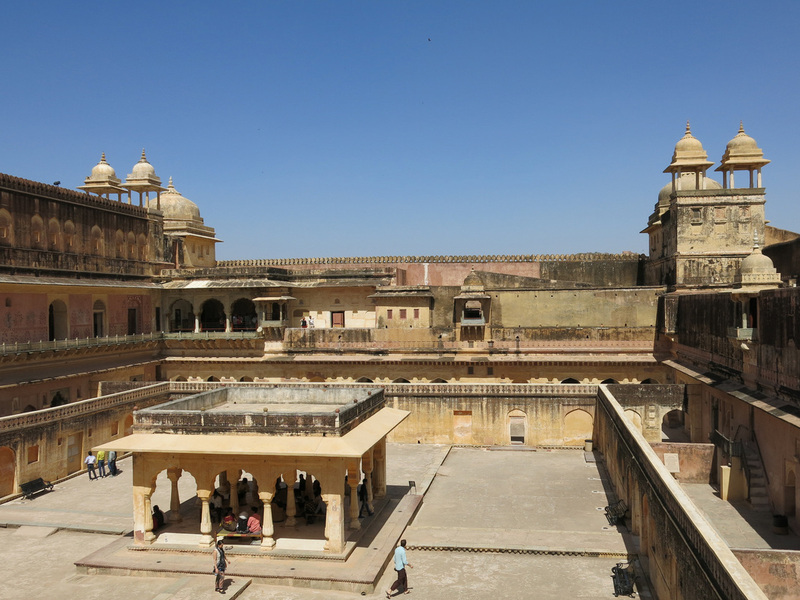 Various vantage points along from the upper levels provide full views of the courtyards below. 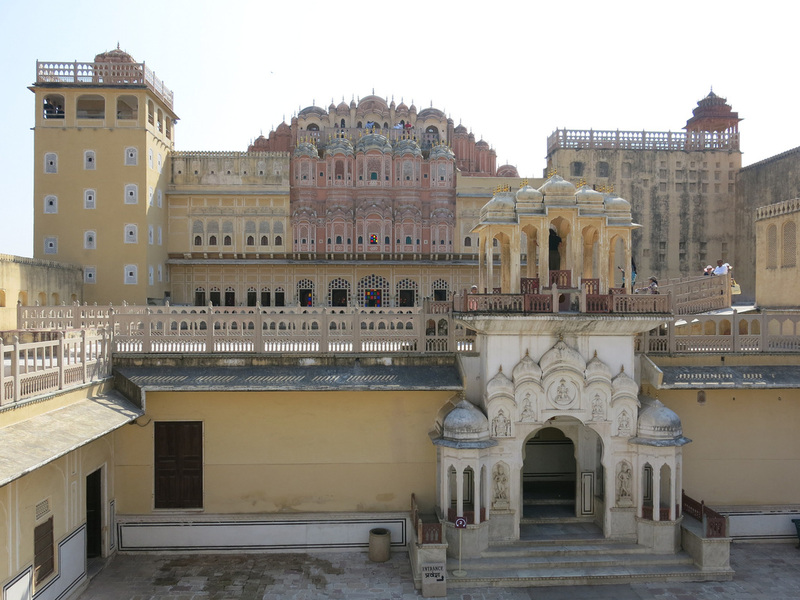 I started to feel a bit fort weary and returned to Jaipur. 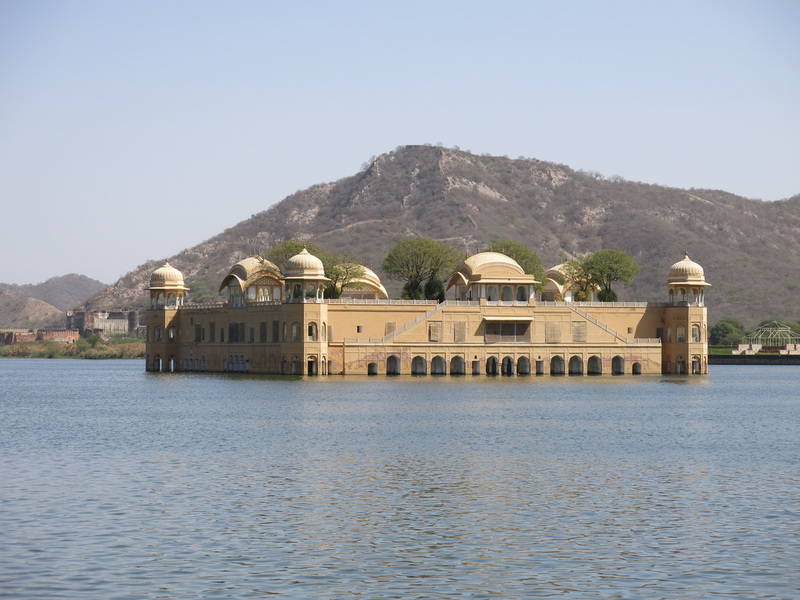 On the way back to Jaipur be sure to stop and take a photo of the Jal Mahal, a floating palace. After the sites I met Krishnan for a masala tea at his house in the Pink City. The house has been in his family since it was constructed…over 300 years ago. A street opening led to an open courtyard and I accessed the second floor apartment unit via a corner stairwell. 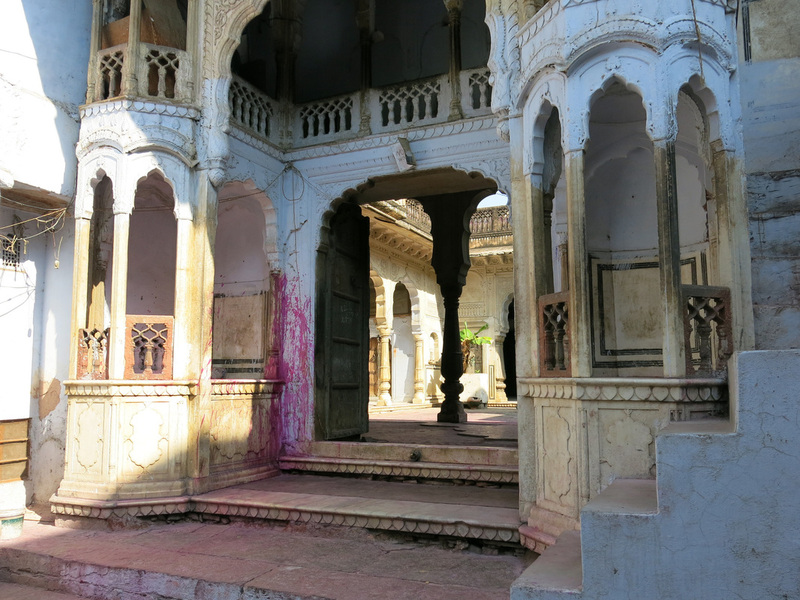 The house had the contoured doorways and colonnades I saw earlier at the palace forts. We talked about each other's background and life in India. Krishnan's wife, oldest son, daughter-in-law, and granddaughter all share the residence and his brother lives on the floor above. 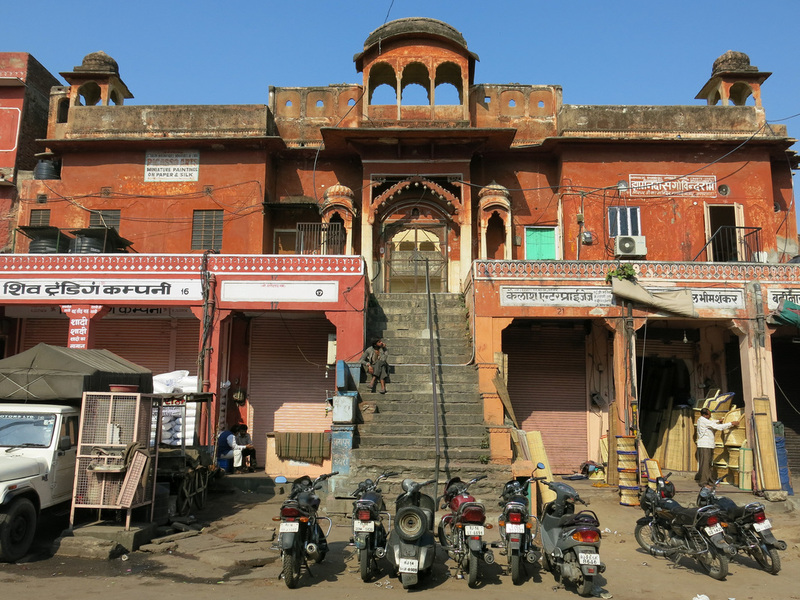 His sons operate a jewelry store in the Pink City. He's an avid coin collector and asked that I send a few US president dollar coins to him when I return home - this is a child's "scam" in India but Krishnan seemed like a upright guy. 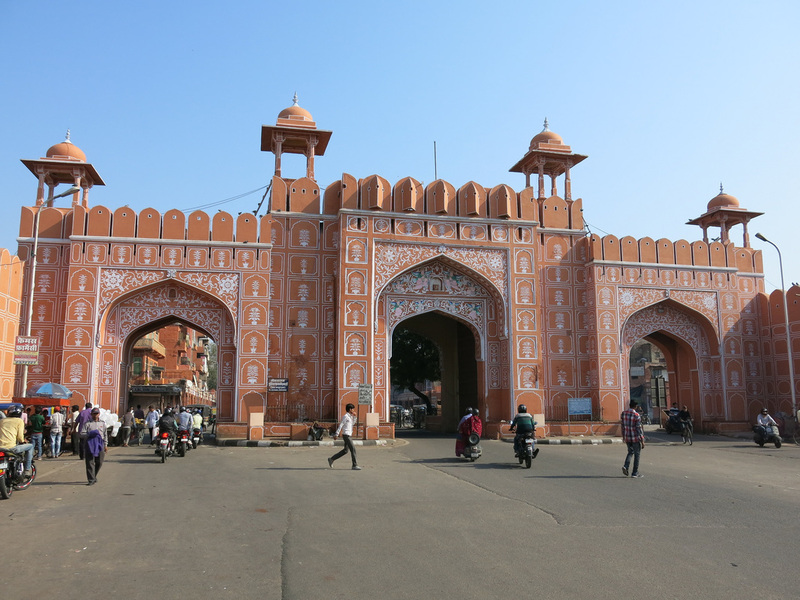 With this newly acquired insider perspective I took another stroll through the Pink City. More shops were open than yesterday and each block seemed dedicate to similar stores - mechanics, home goods, bicycles, etc. 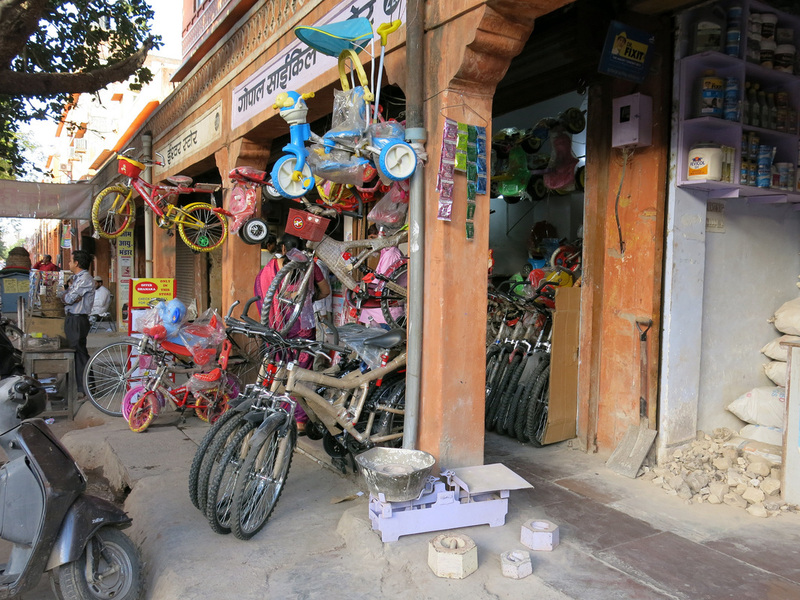 Shops were squeezed next to one another, some no more than five feet in width. I found an open stairwell that lead to the second floor and an overhead view of the busy street scene. Early evening or morning, when the sun is low in the sky is a good time to visit the Pink City because the salmon colored buildings look their best. 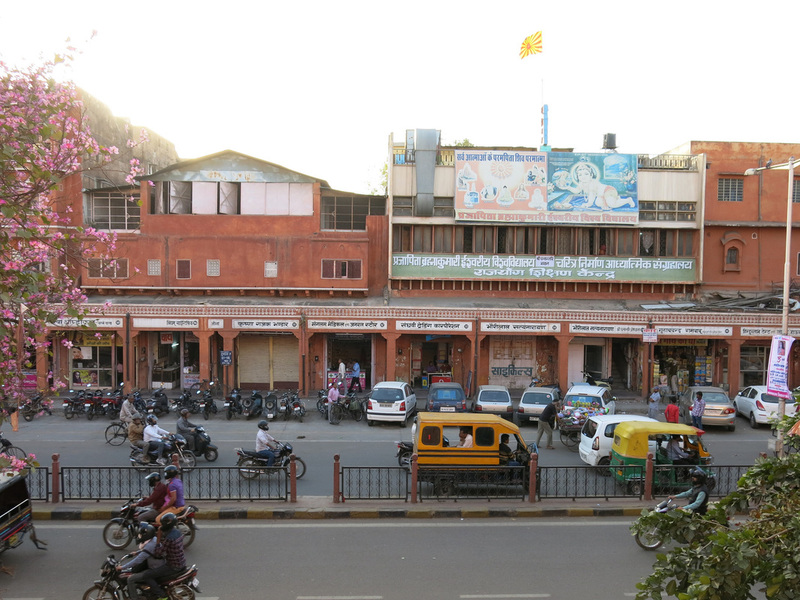 I spent the afternoons and evenings in search of “India Rising” - looking for places, stores, and residents where Jaipur's entrepreneurial and working middle class spend their disposable income, cut across the appropriately named Hospital Road (every other building on the 200 meter block was a hospital), before looping back past the Raj Mandir and to MI Road. No luck. 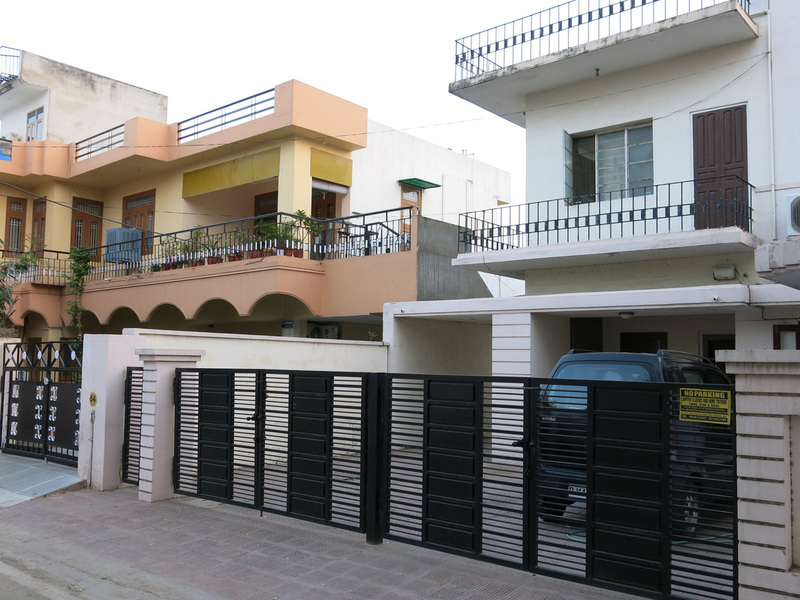 I spent the early evening walking around an upper class area near the hostel, a neighborhood home to many of Jaipur's Chief Ministers - their homes were easily spot from the military body guard presence out front. I saw a new Hilton hotel but no cafes, shops, or restaurants. 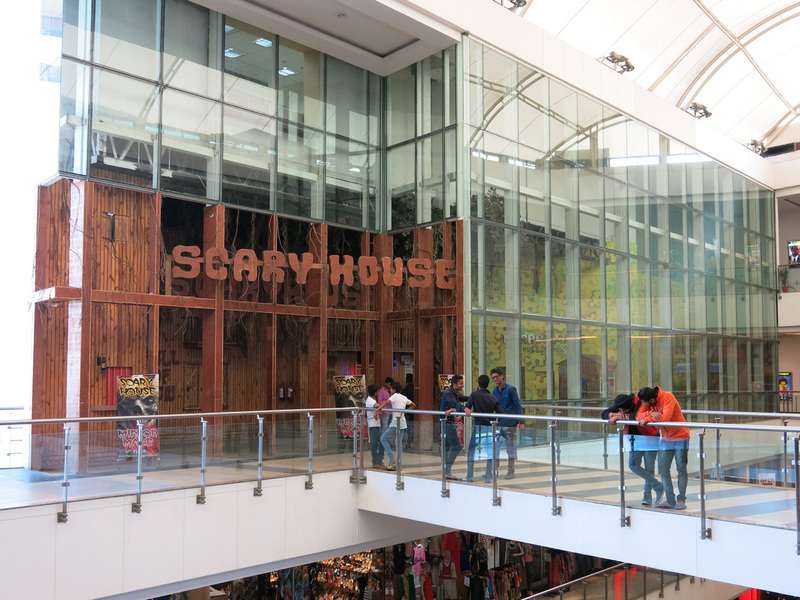 The second afternoon I went to Pink Square, a recently opened mall five minutes east of the Pink City off MI Road. 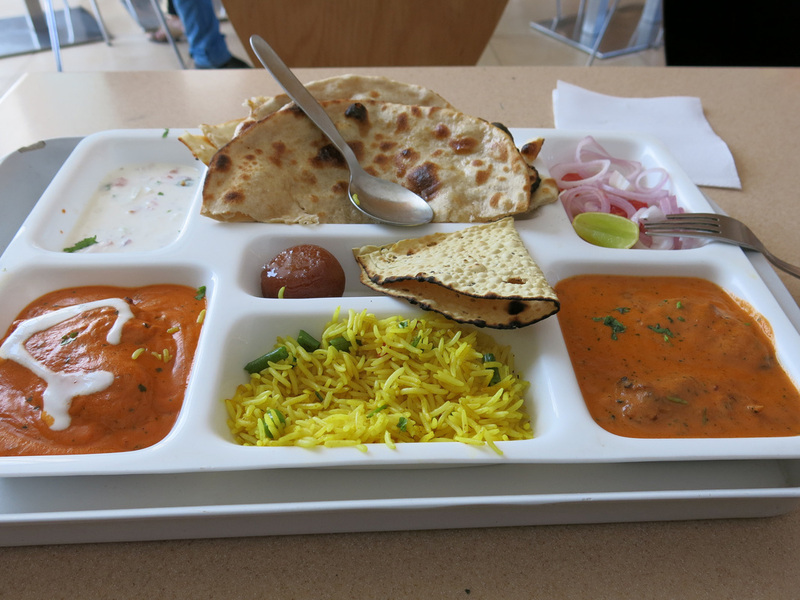 I ate a non-veg thali from the 4th floor food court. While sitting I began to notice that most - say 80% - of the mall's patrons were men…just like the rest of India street scenes. There was lots of handholding brotherliness taking place and I can only assume hands were gripped a little harder in the Horror House's Hall of Mirrors.